Need to find a pet friendly hotel in Boston MA? Click the Pet Friendly Accommodations Button below!" Boston is a truly international city in which everything is so close that the visitor only needs a pair comfortable shoes to visit all the points of interest. It is not to be surprising that it is known as the first major city of the United States. From Back Bay to Beacon Hill, to Newbury Street and the North End, Boston has something to offer to every visitor. Boston boasts thousands of shops including all of the luxury brands, magnificent restaurants, sites of historical interest and numerous museums. 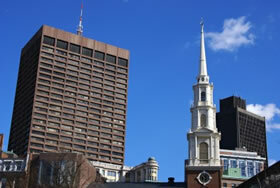 Finding pet friendly hotels in Boston is easy with PetTravel.com. Click the SEARCH PET FRIENDLY ACCOMMODATIONS button above for a list of pet friendly hotels, motels, bed and breakfasts, small inns, and vacation rentals in Boston. You can even book your reservations on the same page! We even offer pet sitters in selected cities who will "petsit" your best friend while you go out to dinner.